In this article, I will try to conclude the easiest possible ways to optimise page speed and to improve your website’s Google ranking. Also, it is not only a research article but it explains each practical steps towards reducing page loading time which I learnt from my personal experience. Tips in this article have successfully achieved Google PageSpeed Score from 32 to 85 for our website. According to kissmetrics.com, 47% of online users expect the website to be loaded in 2 seconds and 40% leave the website if it doesn’t load in 2 seconds. Similarly, 79% of the shoppers wouldn’t return to a website if they are not satisfied with its speed. Maile Ohye (Developer Programs tech lead at Google) stated two examples in her video about the importance of fast loading web pages. Example one, Shopzilla increase 7-12% conversion by optimising their website load time. Her second example is Firefox in the video, Firefox downloads increased by 15.4% which means 60M extra downloads. So, one main reason to have fast loading website page is to increase the conversion. The more traffic you the better you ranking would be, so get ready for new traffic stream. HOW TO KNOW/TEST WEBSITE LOADING TIME? In this way, you avoid sending requests to another server as well as the delay of the external server. ExpiresByType application/pdf "access 1 day"
You can modify the ‘ExpiresBy’ period according to your own needs. Most of the time to maintain the look and feeling of the website we compromise on website loading time which is not a wise option. If the user cannot load your website then how would he see the beauty of it? I wouldn’t say that create a boring flat website but keep a balance between the look and loading time. Avoid using too many large pictures and heavy animations. Google explain the image optimisation here. If you cannot compromise on pictures then you will need to compromise on its quality by optimising them to reduce its size for quick loading. There are different online tools available to optimise your images, click here to optimise your web images online using Optimizilla, where you upload your website images and download them once the images are optimised and compressed. 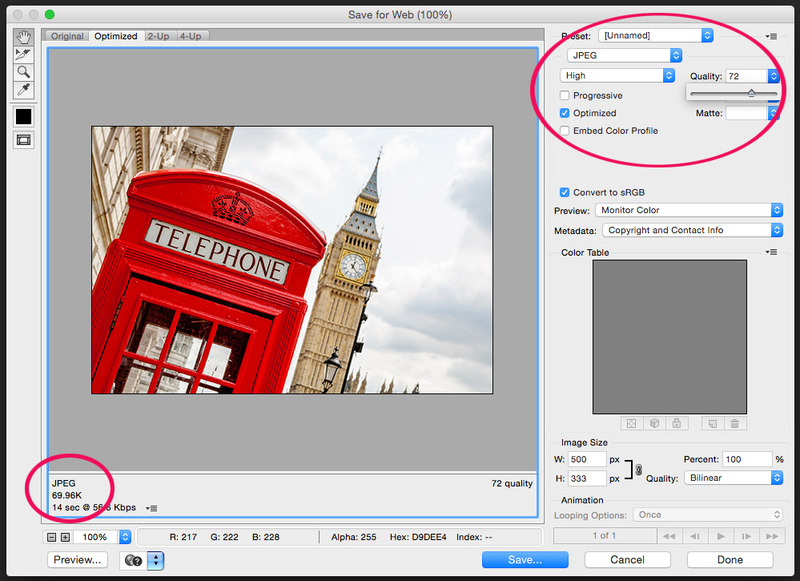 If you are familiar with Photoshop then you can optimise your web images by yourself. You can reduce the image size to half of the original. The below images shows that an image with JPEG ‘Quality:100’ is 170K and it comes to 70K by reducing the quality to 72. Similarly, you can use GIF and PNG image formats for limited colour images. Your server response time is also one the factor which may cause slow page loading. There are several factors which may affect your server response time such as the resources each page use, slow database queries, the hardware and software server uses etc. You can address most of these factors but the most important one is slow database queries which will cause problems at every stage of browsing for the users if it is a database driven website. Each browsing request starts from the user’s browser and passing through different data centres it gets back to the user’s browser with the requested information. Content distribution networks (CDNs) are networks of servers which holds your web site at multiple, geographically diverse data centres so that users can get the shortest possible route to your files for speedy delivery. Click here for Fast Loading Web Designs.